Ancient cultures used interventions in the landscape as a means of interpreting celestial events by observing the rising and setting of stars and planets. The meaning of visual observations often went beyond their perceptional value, gaining a metaphysical and religious meaning. The rising and setting of stars and planets were associated with gods and became a source for myths and rituals. In ancient cosmologies, the perceived landscape became an image of the universe. 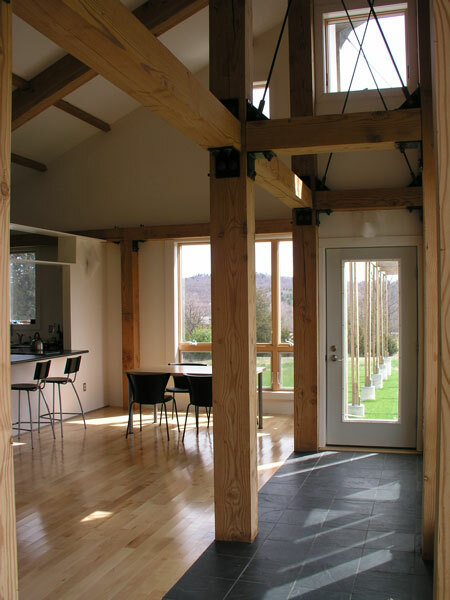 This notion, in the contemporary interpretation of sustainability, shapes the design intent of the passive solar house of Sun Farm, in the rolling hills of the Hudson Valley farmland. axis The north-south axis (the decumanus in the ancient Rome) and east-west axis (cardus) provide orientation in the landscape: the decumanus is constructed as a series of free standing columns, whose shadow at noon visually aligns with the columns themselves. The length of the noon shadow varies according to the day in the year cycle. The east-west axis is identified by a trellis which frames the rising of the sun at the equinoxes. The axis originates at the midpoint of the distance between two 50' high hickory trees, some of the oldest trees in the property. frames In the visual composition, architecture frames the landscape and the sky, offering ever changing spectacles of land and clouds. Frames become a reference system for stargazing, revealing the different constellations by their positions in reference to the structural grid. The intervention in the landscape generates the main geometry of the house. structure shapes space The module of the columns and the trellis continues in the structure of the house; 22-foot high douglas fir posts and 40-foot long beams. The slope of the copper roof is perpendicular to the earth axis, which is parallel to the equatorial plane. The structural vectors intersect with the planes of the walls; functions and daily activities are defined by the boolean intersections of the walls. The construction approach and materials are characterized by minimalist details. The main living space is a simple volume, in the Zen tradition, filled with light and open to the south. 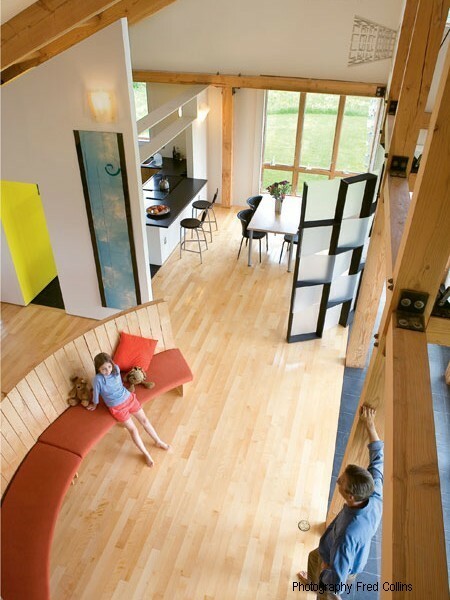 The house uses passive solar energy principles. The main facade faces south: GPS (Global Positioning System) was used to determine the true south to optimize the exposure. Glass is positioned at a height which allows only the low winter sun to penetrate. 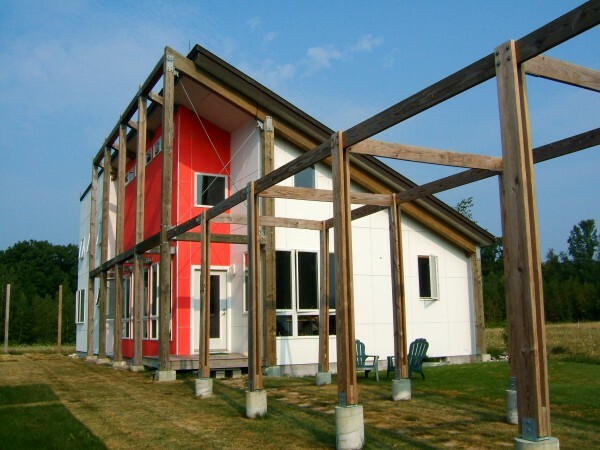 The exterior envelope utilizes Structural Insulated Panels to achieve high insulation values and to simplify the construction process. The manufactured panels also fit the 8-foot grid of the structure, as do the 4-foot square exterior fiber-cement panels. The frame at the southern facade is intended to support an array of photovoltaic panels. 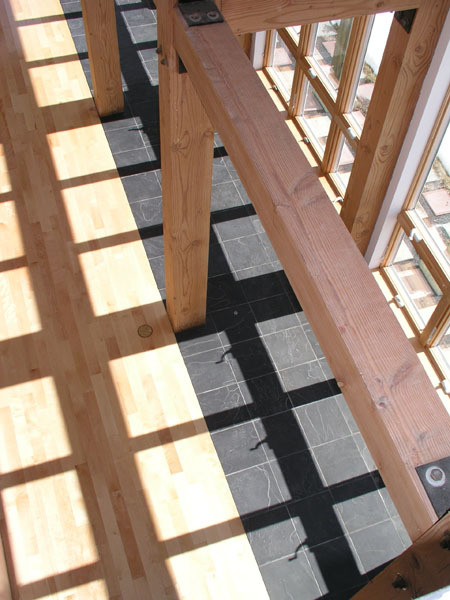 The orientation of the living spaces follows the sun's daily path. Kitchen and eating are oriented to the east --to begin the day with the morning light-- and sleeping areas are oriented to the west --to end the day with the setting sun. square The house and landscape design follow a square, as the shape which embodies the four cardinal directions. The Sun alignments --defining the four cardinal points-- inspire a square-based geometry. Divisions and multiples of the module of the structures, in a geometric progression, determine square patterns in the surrounding landscape as well as the facade composition. 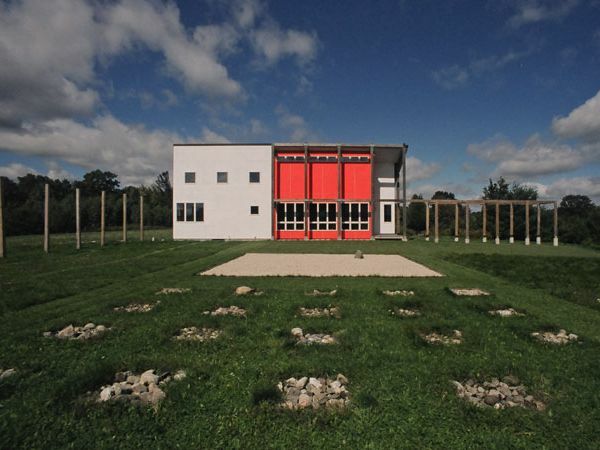 br> The 24-foot square of the zen-inspired gravel garden is mirrored in the square of the south facade, repeated at a smaller scale in the square arrangement of the fiber cement panels and in the pattern of the fasteners. The overall design promotes a serene contemplative and meditative state stimulated by different perceptions: the spectacle of the moving clouds framed by the structure, and the observation of the slow and dramatic change of light on the facades. The main design intention becomes fulfilled by inhabiting the house, in harmonious living with nature.